Persian Gulf Pearls Prefer Red! Sa'ad Ismael in the above photo is holding the Arabian|Persian Gulf pearls in Traditionally, it is the only acceptable way to handle Gulf pearls. The Persian/Arabian Gulf is renowned for its Natural Pearls. 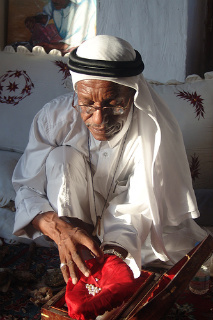 Famous since Biblical times for its pearls; Bahrain with its vast oyster beds was referred by the Greeks as "Tylos". It was the centre of the pearl trading, when Nearchus came to discover it serving under Alexander the Great. In the past Bahraini pearl merchants such as Sa'ad Ismael would have been able to spot a natural pearl just by looking at it, today's market is more complex. Making the distinction is no small issue in Bahrain, where it is forbidden to trade in cultured pearls. The Iranians refer to it as the "Persian Gulf" and the Arabs, call it the "Arabic Gulf". This strategic stretch of water is located in Western Asia between Iran in the north-east and the Arabian Peninsula to the south-west. However, as far as the Bahrain Natural Pearl itself is concerned, the Persian Gulf is pearl paradise. No other place on earth did pearl oyster grow Pearls more plentiful, of such high quality, radiance and size, than in the Persian Gulf waters near the strategic Straits of Hormuz. Pearl divers were able to dive often in the warm shallow waters of the Persian Gulf, sprinkled with its many fresh water springs. This unique mix of fresh and saltwater that surrounds Bahrain is one of the secrets behind the special lustre and brilliance of the Arabian-Persian Gulf pearls. When two oceans meet, the most beautiful Natural Pearls are born. From east to the west, royalty, celebrities, Indian princes, famous Hollywood actresses, like Elizabeth Taylor (remember the priceless, La Peregrina Pearl, who could forget!) and couples in love, have fallen under the spell of the Pearl of Pearls. Famous Collections from around the world often contain Natural Pearls. For example, The Jewelry of Umm Khalthum (Umm Kulthoum) (1904-1975) the beloved singer of the Arabic world, India-style Pearl necklace (above image) sold on the 29th April 2008, for $1.4 million USD - ten times its' original value. The pearl necklace was a gift from Sheik Zaid ben Sultan, founder of the United Arab Emirates. Read about Large Pearls: Two of the world's largest Natural saltwater pearls are the 'Pearl of Allah', the 'Arco Valley Pearl' and the Giant Dubai Natural Pearl is a pearl monster.